Everyone wants website visitors. And that’s where a call to action web design comes in. All the website visitors in the world won’t help your business if they do not “convert” and become customers. The first step to turning a website visitor into a customer is to impel them to take an action. If a site is drawing considerable website traffic, but not converting customers, chances are that either the website’s call to action (CTA) is weak, or the site is not engaging the customer enough to motivate a response to the CTA. Within your site you should provide multiple opportunities for your visitors to engage more deeply with your company and respond in some way. Ideally, these opportunities should be incorporated into the planning stages of a design so that the website design helps convert customers. Let’s take a look at some home pages and what elements they’ve used to engage their visitors and effectively incorporate calls to action. 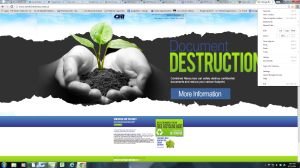 In the example below, CRI offers a website call to action on each changing image in their slide show. While each slide contains a different call to action button, each one also offers a button to click that promises “more information” on related topics of document destruction and recycling. By incorporating a call to action in the slide show, which in itself is a chief element of visitor engagement, the visitor actually receives three different and varying calls to action, providing a greater likelihood that one of them will garner a click. If the first slide does not engage the visitor, chances are the next one, or the next will. This homepage also attempts to engage the visitor more deeply into the site by using website call to action alongside special offers and incentives. CRI actually offers several, so they address many different types of visitors with varying levels of readiness to convert on one page. A customer who comes to the site already “sold” on the company can easily find and click for the “free recycling audit” and be immediately connected with the contact page. Someone who needs an overall review of what the company does can read the downloadable whitepaper in the bottom right corner, which simultaneously captures their email for the company’s marketing list. A website visitor who just needs more individualized information to start the process can access a calculator on the “try it now” button in the bottom center to get information specific to their company, so they can take the next important step towards conversion. Customers can become disengaged very quickly if they have to go looking for a contact telephone number. On this home page, the telephone number is conveniently located at both the top and bottom of the home page so there is no need to navigate to the “contact us” page to find a number. At the bottom, a direct call to action in the words “Contact Us Today” even precedes the telephone number. The recruiting firm New Way Search provides two entry points, tailored to their two main audiences, employers and candidates. By providing different entry points into the website, the call to action takes the visitor down the road to conversion by engaging them to the next, and most desired, level of the website. Color can be a powerful tool for grabbing attention and engaging the visitor. On this page, the “contact us” button is the only dark green element, making it stand out more easily to the site visitor. Depending on the website design, a color that is complementary to the site’s color scheme, or one that is completely discordant can work best. For example, putting a bright orange call to action button on a muted, pastel-based color scheme may be a bold, but potentially effective strategy, depending upon the design and the businesses. Call to action button color is just one of many factors that is often subject to A/B testing because it has so much power to engage visitors and encourage them to respond to the website call to action. 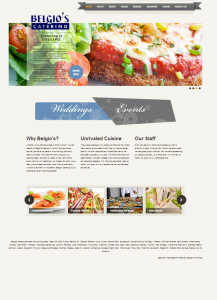 This home page from Belgio’s Catering uses tantalizing, color images of food as an indirect call to action to engage the visitor to the next step. When visitors click on the photo, they go to a page that gives specific information on the meal, including menu options and prices. The decision to use images, over a brightly colored button, conveniently provides more specific navigation to the visitor, but is also a more engaging and enticing target to click! Don’t Crowd. Leave some white space around your call to action buttons. They will stand out more. Don’t Have Too Many Calls to Action. Your page need not look like the Vegas strip. Design it to direct the visitor to a few strategic actions. Do position the calls to action where people naturally look. The top right corner and center of the page are “hot spots” for the eye. Do use “urgent language”. Don’t settle for “click here.” Use active, motivational words like “Learn More”, “Join Today,” “Get Started”, etc. Do Experiment with Color. The button color on the call to action is very important. Consider alternatives. Do Test the Navigation. What happens after the visitor clicks on the call to action? Do they need to do anything else? See the call to action through from page to page to make sure your customer is prompted through each step of the conversion process. From the initial design of the website to the latest revisions, the call to action in web design is one of your most important elements on your site. By implementing well-crafted, abundant calls to action you will engage more visitors and ultimately, increase your conversions. If you are noticing high site traffic without conversions, a weak website call to action may be the reason. At Design & Promote, we are great at turning under performing sites into strategic, conversion vehicles. Call us today for a free evaluation of your site and recommendations on improving its online performance.